GoMadKids is putting the finishing touches on its Turmali online adventure game for kids. Aimed at players ages 6-12, the game will combine the 130 eventual eBooks in the GoMadKids series with online gameplay, in an effort to make reading more fun and rewarding for children. In Turmali, players travel to a land where seven floating islands were once connected by rainbow bridges, which were themselves powered by tourmaline gemstones. The Light Killers, a group of creatures who hate light and laughter, have stolen the gemstones, disconnecting the islands. It’s up to players to complete quests, mini-games and other challenges to find the lost gemstones and restore the land of Turmali to its former glory. 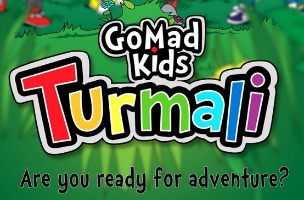 Turmali is said to provide children with hours of gameplay, as players follow the twelve GoMadKids, kids from around the world who like to “Go Make a Difference.” These characters star in the brand’s eBooks, with the books themselves containing clues and information that can be used back in the game. In addition, these digital books will offer quiz questions to test players’ comprehension of the material, and users will receive virtual currency as they read new books. For social play, gamers will be able collect and trade trading cards, as well as chat with others in real time using template phrases. This ensures that even if players speak different languages, the text will appear in the proper language for each player. According to the developer, Turmali is 95 percent developed and the first three lands of the game are ready to launch in beta by the end of November. The remaining four islands will come online in weekly intervals after the initial release. However, the developer is looking for some financial backing from the community to fully implement their eBooks into the experience. Turmali has a Kickstarter funding goal of $20,000, and has earned over $1,000 of that goal, as of this writing. The more funding (and stretch goal funding) the campaign receives, the more GoMadKids eBooks can be integrated into the experience. Backer incentives include subscriptions to the game’s “advanced game features,” and the eBooks themselves, among other items. Turmali is being produced for launch on browser, as well as iOS and Android devices. More information on the game is available here.